We are not the only species who lives and dreams on our planet. There is something enduring that circulates in the heart of nature that deserves our respect and attention. I ended my winter tour season last weekend, a little earlier than usual, but it finished on a spectacular note. I had two groups of wonderful people; one all day Saturday, and one Sunday. 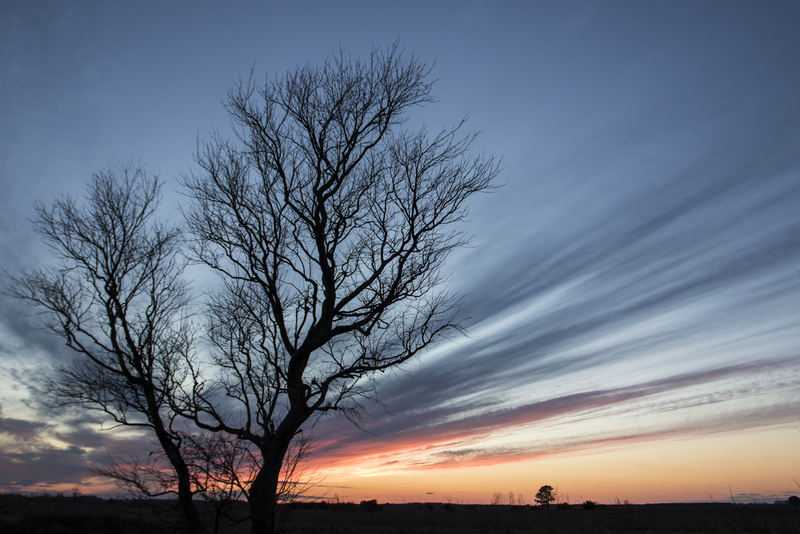 It was beautiful weather, and both mornings started out cold, just the way it is supposed to feel in winter at Pungo and Mattamuskeet. There continued to be a couple of things this season that baffle me. I am still seeing the fewest number of bears of any winter since I started visiting this wildlife-rich region. And the snow geese are still acting strange, coming and going at a very high altitude, and I never saw them feeding in any of the refuge fields all winter. 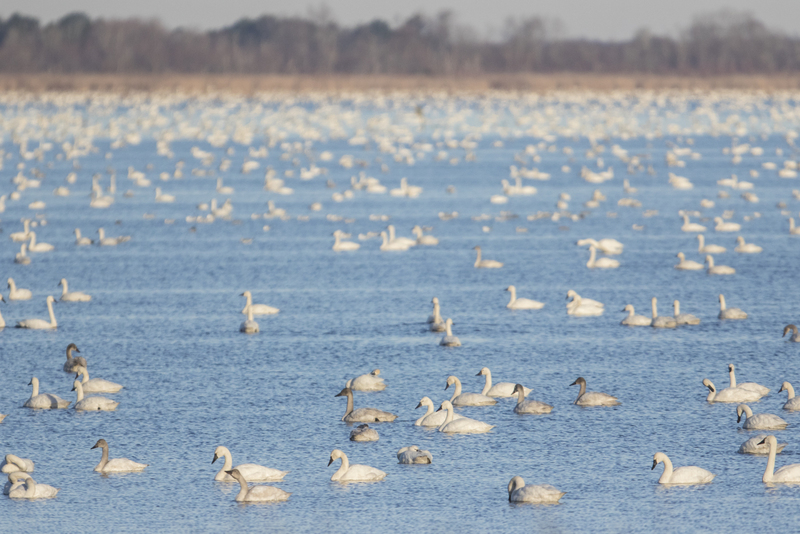 If the few remaining stands of corn are knocked down before they head back north, perhaps the snow geese will make a late appearance. We did finally see six bears on Sunday, five of them the first thing as we drove in past one of the few remaining fields with standing corn. 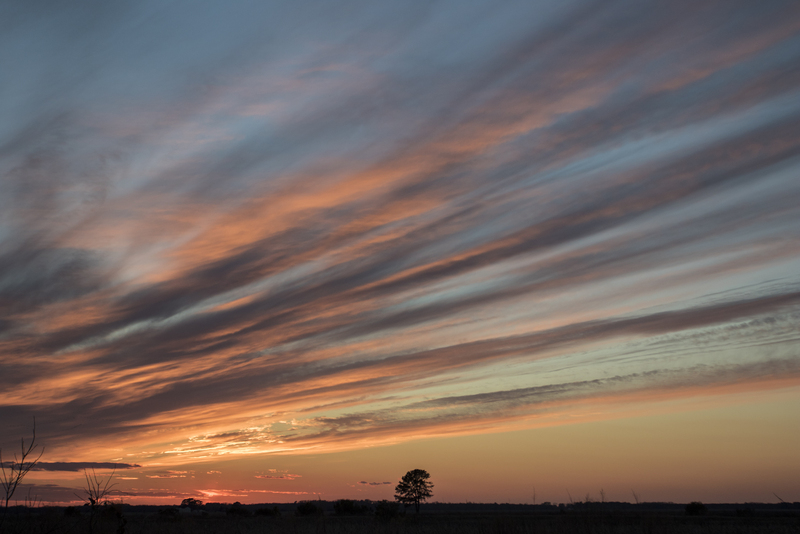 The last was seen after sunset on another field along D-Canal Road at Pungo. Still, no bears the past few weeks along the one-time sure spot, North Lakeshore Drive, aka Bear Road. There is still plenty of sign in the woods, but some of it may be from a month or two ago, before the bear hunting season on adjacent private lands. Almost every pawpaw tree in the woods along that road has been climbed, clawed, or snapped in half by the bears. 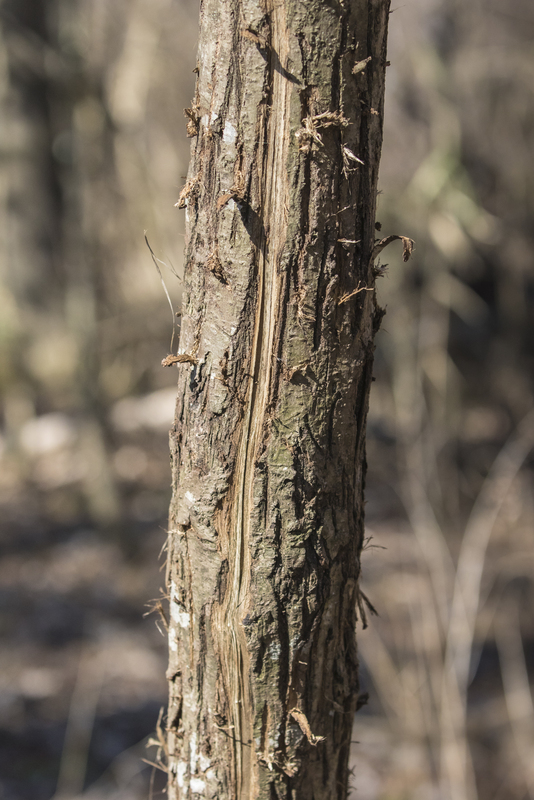 They must really like pawpaws, and, who knows, maybe there is something in the bark they like as well, because many of the mid-sized trees have had their bark pulled off in strips. On Saturday, we saw plenty of birds at the Pungo Unit of Pocosin Lakes NWR, in spite of the closure of the entire road along the south shore of Pungo Lake. The past few weeks have had heavy rains and some vehicles apparently got stuck in the mud, causing the closure. My advice to visitors is, if the roads look too bad to go through in your minivan or sedan, then don’t attempt it (you may be right). The refuge tries to repair the really bad spots if and when they dry out enough to allow their heavy equipment to get in to do the work. Mid-day we ran over to Mattamuskeet NWR where we found high water again limiting the number of birds in the usual spots. 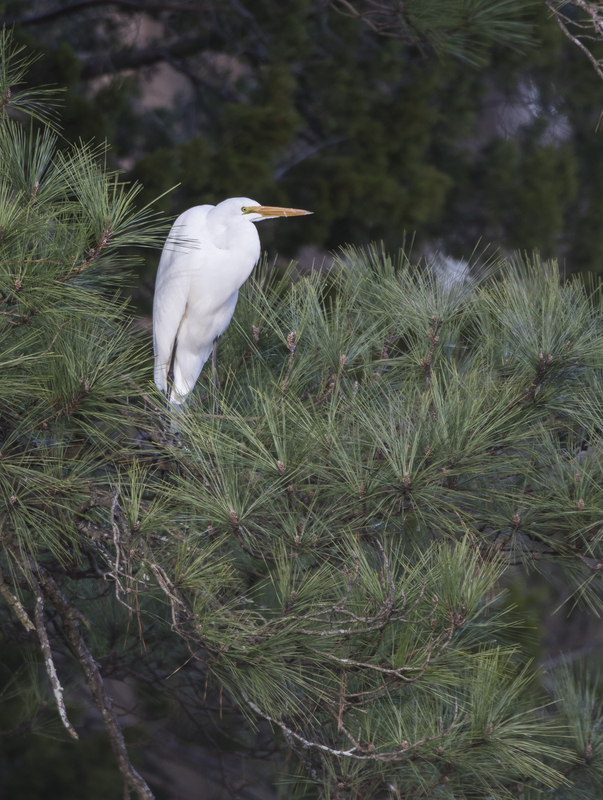 But, there was a good diversity of ducks that cooperated with our efforts to view them through a scope, and we were rewarded late in the day with the first wave of great egrets coming to roost in the trees across the canal from the lodge. That is quite a sight to see them sailing in on cupped wings, squawking as they juggle for space in the soon-to-be-crowded branches. 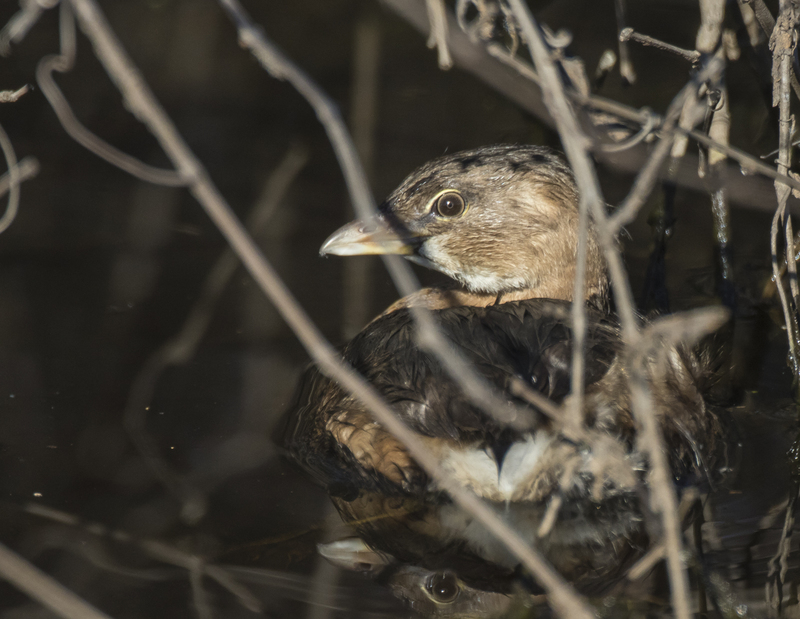 Both days were full of interesting sightings ranging from bald eagles near a swan carcass, to pied-billed grebes hiding in the brush along the canals. We had a nutria with 3 young in one canal, plus a very unusual blonde-colored nutria at sunset. Finally, back at Pungo late in the day, we witnessed an incredible sunset show of tundra swans flying in and out of the lake. The strange thing was that as we drove in about 4:30 p.m., there were thousands of swans leaving the lake, which seemed late for so many to be headed out. But, they all returned (plus thousands more it seems) as the sky turned orange-red at sunset…spectacular. Amazing what a difference a day makes…Saturday morning was windy, causing the birds (numerous ducks, snow geese, and tundra swans) to seek shelter on the lee side of the west shore, which left the area in front of the observation platform a void, without any waterfowl readily visible. Sunday morning was calm, and our arrival at the platform before sunrise was greeted by thousands of birds just beyond the lake shore in front of us, seemingly filling almost every square foot of the lake’s surface. As the sun climbed higher, the dark shapes became a sea of brilliant white objects that filled the air with their sounds. After the sunrise show at the platform, we headed over to “Bear Road” for a walk. 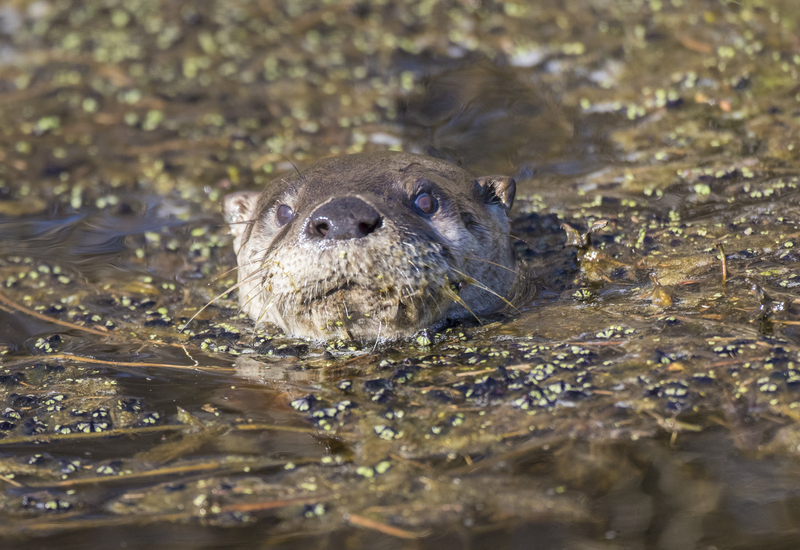 Along the way, I spotted a pair of river otter in the roadside canal. They tend to raise up and snort a time or two when they first spot you, and then often disappear beneath the waters with a distinct kerplunk, only to reappear near or far, depending on how much they feel like tolerating your presence. These two were busy searching for fish in the thick mats of vegetation in the canals, and by the looks (and sounds) of things, they were quite successful. One guy caught several small fish while we watched, tossing his head back and crunching them in his jaws, the hapless fish seemingly gazing at us asking for help. 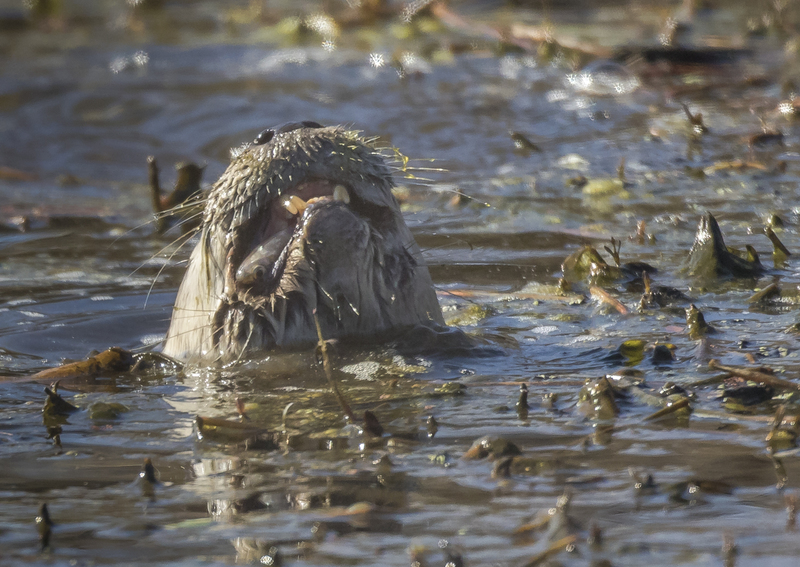 But each fish disappeared rather quickly, with the otter then glancing our way before disappearing into the floating green mat. After the otter, we walked down Bear Road, but didn’t see much other than lots of bear sign, and a couple of groups of red-winged blackbirds. Once back at the car, we were starting to grab a bite to eat when a car pulled up with folks I knew from Christmas Bird Counts at Goose Creek State Park years ago. They said they had just seen a wood stork feeding in a canal around the corner. I must admit, a thought raced through my mind…I responded, a wood stork?, as if questioning their ID of this somewhat unmistakable bird…but a bird I have never seen anywhere near this part of the state in over 30 years of birding. Wait, I told myself, these are people that used to come to the Christmas Bird Count, and they should know a wood stork if they see one. Yes, they said, a wood stork, and they had stayed with it so long that they got tired of taking pictures. They drove off, and I interrupted our lunch break and said, Sorry, but we have to check this out. We quickly loaded up and drove around the corner and could see a car stopped down the road. As we approached, I saw it, and indeed, it was a wood stork! It was a juvenile, distinguished by its straw-colored beak (instead of black of an adult) and it fuzzy feathers on the head and upper neck. It totally ignored us as it went about its business of feeding along the canal edge. 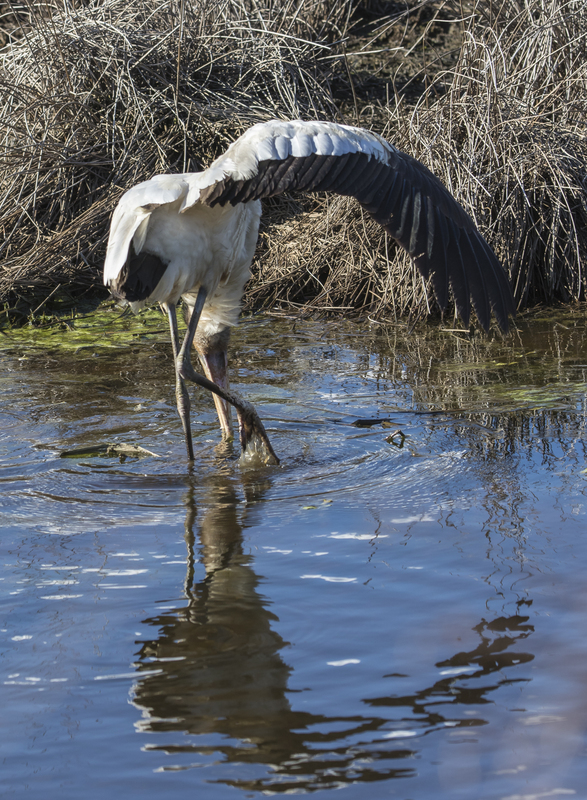 I have watched storks feeding in a group in Florida and South Carolina, but this one was doing something I had not seen – slowly walking, shuffling one foot, then the other, beak agape. 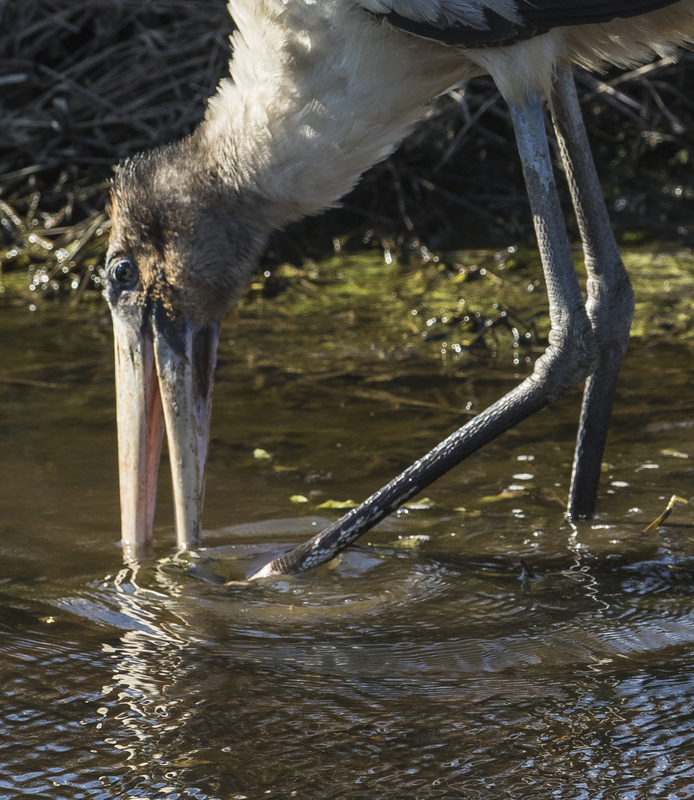 The strategy is to startle a prey item by kicking the substrate with your feet, and if a fish, crayfish, or whatever hits the beak, it snaps shut. The really odd thing it did was once a minute or so, it would extend one wing (almost always the right wing) and pivot, without pulling its beak out of the water. Some waders will spread a wing to supposedly startle prey, so maybe that is what was happening, or maybe it was to help balance the bird as it did a tight spin. Here is a quick video clip showing this behavior, although the extended wing here is not as prominent as in most of the spins we witnessed. And my friends were right, we stayed with this bird until we got tired of taking photos…what a treat. Another trip over to Mattamuskeet with similar results to the day before, although there was one highlight that made me think this trip might go into the record books for unusual sightings. As we drove in the back entrance of the refuge, a mink ran across the road in front of us. Wow, a mink, one of the most elusive mammals in our state, out in the middle of the day. 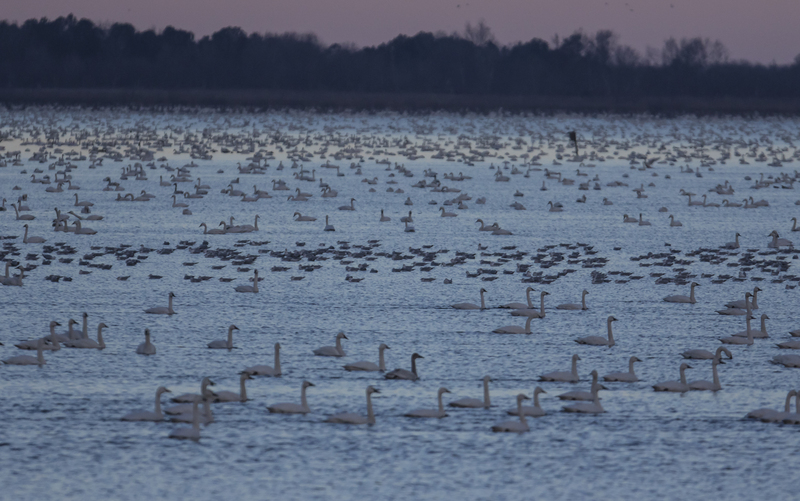 We headed back to Pungo later than usual and, once again, thousands of swans were flying out of the lake around 5 p.m., much later than in past winters. But this time, some were landing in a cut-over corn field right next to the refuge road. We stopped, got out, and stood in awe of the sights and sounds. This short video gives you some idea of the spectacle, but imagine this going on all around you, the sky full of birds. As it grew darker, thousands of ducks came out of the swamps and circled a field of standing corn next to the swan field in what one young guest the evening before had called a “ducknado”. 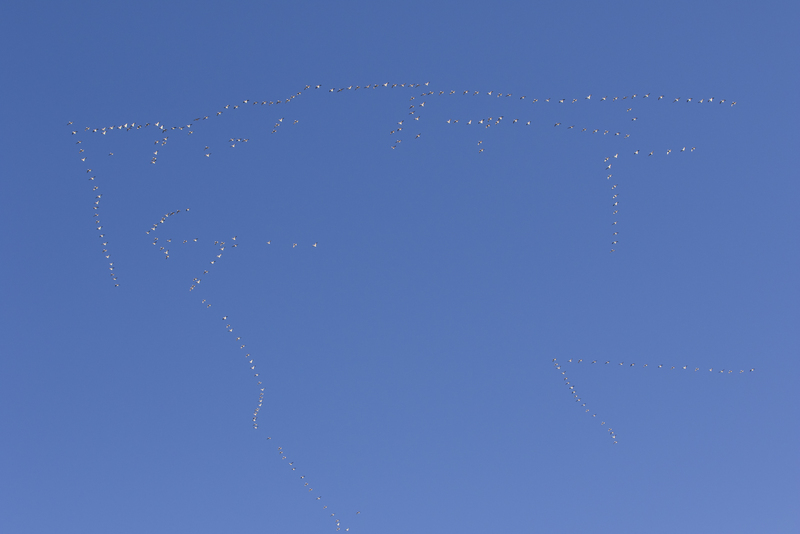 Birds everywhere in the sky…amazing. To top it all off, the sunset was painting the sky with broad brush strokes of orange, gray, and pink, with long lines of the black silhouettes of wings, most still heading west, away from the lake. 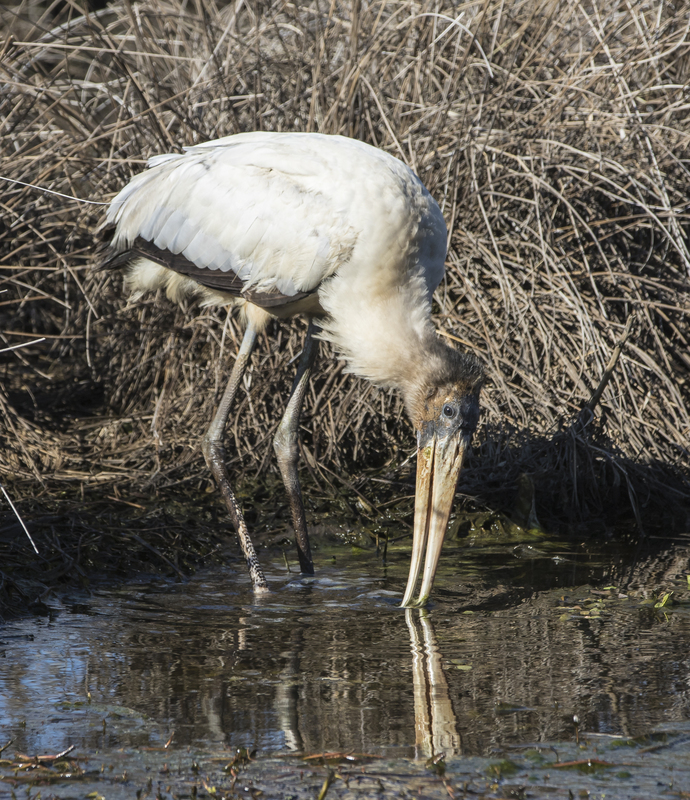 This entry was posted in Natural History and tagged mattamuskeet national wildlife refuge, pocosin lakes national wildlife refuge, pungo, river otter, winter, wood stork by roadsendnaturalist. Bookmark the permalink. Pungo is probably my favorite place in the whole world! I’ve been going there since I was a little boy and I plan to continue visiting until I’m no longer able to so (hopefully no time soon). Like you, I’ve noticed that the bears have been conspicuously absent this season. It seems to me that the amount of corn planted on the refuge was dramatically reduced last year. Could that possibly have something to do with their disappearance? It would be very interesting to talk with one of the refuge staff and hear their opinion. In the meantime, keep up the great work! Maybe we’ll run into each other on the refuge one day. Thanks, Bobby. I agree that there seems to be less corn on the refuge this winter, plus I believe USFWS is mandating a switch to non-GMO corn on refuges, which looks like it may be a lower yield per acre. But, I did see several bears in one of the hot-spots that does have some standing corn before the bear hunting season, and now am not seeing hardly any in that area. I am just not sure what has happened – were some of those bears harvested just outside the refuge boundary (which is very close)? Did hunting on adjacent lands spook the bears and they have changed their behavior (perhaps being more active at night)? Has visitation increased so much that bears have been disturbed in that area by the presence of people? It will be interesting to see what the summer brings in terms of sightings. great post and a fine end to your winter season. Congratulations! Thanks, Mary. By the way, really enjoyed your talk the other night. Fantastic photos and stories.